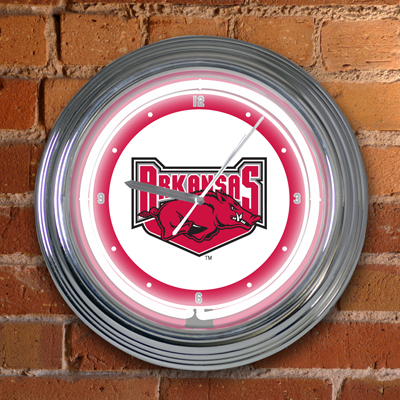 Display your team pride and never miss game time with this officially licensed Arkansas Razorbacks Neon Clock from The Memory Company. This neon clock features chrome accents highlighted with your teams’ logo and primary colors surrounded by neon lights. The clock’s lighting neon tubing plugs into a standard outlet. This neon clock is a perfect addition to your den or game room. Clock requires 1 “AA” battery (Not Included). Measures 15” Diameter.